Wow, Fall seems to have come in with a bang here in Central New York. Today was a rather blustery damp rainy day. I'm so not ready for Summer to come to an end, but ready or not, here it comes. But I do also love the color changes of the leaves, Pumpkin everything along with warm cozy fuzzy sweaters etc. but, I just wish we had a few more weeks of Summer. Anyhoo, last weekend we held our first annual full day retreat and OH MY we had a FABULOUS time. We had lots of fun and LOTS of creating. I really wish you could have been there..maybe next year? 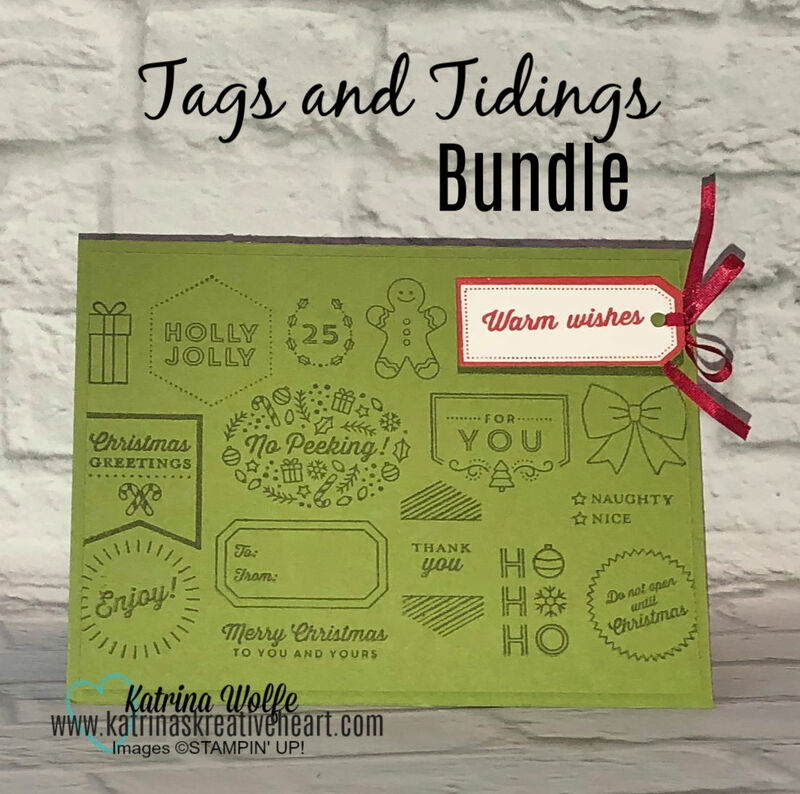 Well today, I want to share a fun card I did using the Tags and Tidings bundle from the Holiday catalog. 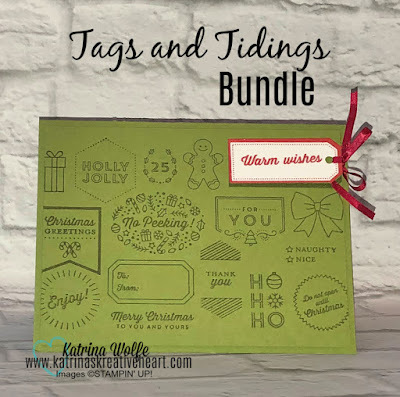 This fun set actually creates 16 adorable tags with one stamp and one die! But, going "outside the box" I created a fun Christmas card with the stamp and die. Using the die, I was able to "spotlight" an area on the card front and it looked pretty cute. To create this card, I started with a standard card base of Old Olive measuring 8.5" x 5.5" scored and folded at 4.25". I then cut a second layer of Old Olive measuring 4" x 5.25" and stamped the tag images in Old Olive ink. I attached this layer to the card base using Stampin' Dimensionals. I then stamped the tag images onto Whisper White with Real Red ink and ran them through the Big Shot with the coordinating die. I then took the tag with the sentiment, "warm wishes" and threaded 1/8" Real Red ribbon through the tag hole and tied a bow. I added it over the same Old Olive image using Dimensionals. This was a quick and simple card that was fun to create. I will be doing some more playing with this one as I'm sure there is more that can be done with it, so stay tuned!